The Stamina AeroPilates Reformer with Free-Form Cardio Rebounder has been designed to enable users to reach and maintain their target heart rate as effectively as a treadmill would. It aims to do this while being gentle on the users’ joints and without concussing their legs, hips, or spine. If you wish, you can perform advanced exercises with this machine because the device is elevated about 10 inches off the floor. A durable steel frame and heavy-duty elastic cords allow you to shape and tone your entire body through 50 exercises. The product’s adjustable headrest and foam shoulder pads provide comfort. The reformer also comes with two instructional DVDs and a colorful wall chart. The customer feedback for the Stamina AeroPilates Reformer with Free-Form Cardio Rebounder at Amazon.com has generally been very good and the product is currently rated 4.5/5 stars. The customer feedback for the Stamina AeroPilates Reformer with Free-Form Cardio Rebounder has for the most part been very positive. However, there are also a few issues that the reviewers have encountered, which you should be aware of and factor into your purchasing decision. One thing to keep in mind is that the unit is very heavy. Because of its weight (100 pounds) and the fact that it doesn’t have any wheels, you might find that the product is difficult to move once you have assembled it. For this reason, the reviewers have suggested that new users should be certain as to where they wish to use the reformer and to assemble it in the place in which it is to be used. Negative comments have also been made in regard to the unit’s limited adjustability. It does not cater to all sizes. 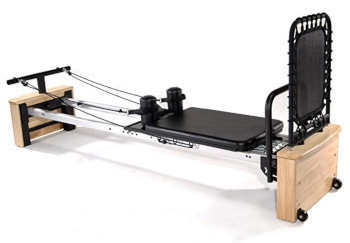 Shorter users in particular might not be able to make use of the reformer effectively. You can check out some more examples of the negative feedback that the product has received by clicking HERE. Despite the negative feedback that we have just discussed, most of the customers of the Stamina AeroPilates Reformer with Free-Form Cardio Rebounder have been satisfied with their purchase. Because the reformer is so affordable, the reviewers have been impressed with and surprised by how sturdy it is. They have reported that it is stable and holds up to continued use. It has also proven to be easy to use. The fact that the product comes with a chart and videos that detail the exercises has made it easy for beginners to get started with the machine. The different intensity levels that are provided further aid this transition. Positive comments have been made in regard to this range of intensity because it means that the reformer offers years of workouts for its users. The customers have found that the machine functions very smoothly, both the platform and the hand straps. In addition, based on the customer feedback, it seems that the bungee cords utilized by the machine offer smoother resistance than springs do. What the reviewers have found to be convenient about this product includes that it offers quiet operation, that its straps are comfortable for the user, and that the unit’s platform allows the floor underneath it to be vacuumed. Finally, positive feedback has also been made in regard to the product’s quick assembly time. Based on the customer reviews, this should take between 15 and 20 minutes. Would we recommend the Stamina AeroPilates Reformer with Free-Form Cardio Rebounder to our readers? We have found the customer feedback for the product to be very impressive and 89% of the reviewers have rated it at least 4/5 stars. We would recommend this item to any of our readers that are looking for an affordable and easy to use reformer that provides a solid workout. Check out the Stamina AeroPilates Reformer with Free-Form Cardio Rebounder on Amazon to find more information to help you make an informed buying decision.